Are you looking for a small, safe yoga class to help with your aches and pains? Have you wanted to try yoga but been concerned the instructor does not understand your physical limitations? This gentle yoga class is taught by Dr. Nancy DeMuth, a skilled physical therapist trained in yoga dance at Kripalu Yoga Center. She has over 30 years of expertise teaching yoga, dance, and movement to a variety of populations. Modified yoga poses, breathing, stretching, gentle therapeutic exercise, and meditation will be performed in a chair. Classes will be small to allow for individual supervision and support. NSPT’s Patricia Sullivan, Phd and Nancy DeMuth, DPT, M. Manip. Ther are currently on a trip to Thailand and Nepal. We will be updating you all throughout their journey! Their first few days in Thailand they were able to catch up with physical therapy colleagues, take part in a traditional Songkran (Thai New Years) water ceremony, and oversee a PhD student that Trish has been working with for years pass her oral dissertation, which concerned evidence-based practice of therapists in Vietnam. We are glad to hear they are having fun and taking part in the local culture! More updates to come! 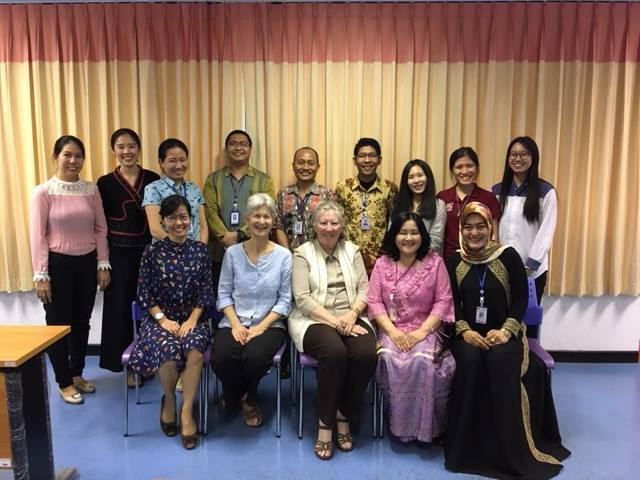 Nancy and Patricia had a successful day last week working with a group of PhD students at Mahidol University in Thailand. They were able to discuss with students how to field questions during oral presentations. It was an active learning experience for the students that received good reviews! We have included a few photos here for you to see. Great work, Nancy and Tricia! We are pleased to announce that Nancy and Patricia have arrived back to town from their trip and are back to their normal work schedule’s this week! Gentle Yoga Class with Nancy DeMuth will start on Monday, April 30 (level 0ne) and Wednesday, May 2 (level Two). Please call 781-631-8250 to inquire about it. Last week in Nepal Nancy was able to teach a "dance therapy for people with Parkinson’s Disease" class to the physical therapy students. This was a new experience they had not yet had in their schooling, and it looks like they had a lot of fun too! Great job, Nancy DeMuth! North Shore Physical Therapy now offers a WELLNESS PROGRAM in addition to the physical therapy services. The goal of the program is to establish a baseline of your musculoskeletal health and reduce the risk of future health problems by promoting a safe and healthy lifestyle. When you understand the risk factors that affect your long term health and how your present health compares to peers of your age, you have a road map to live a long healthy lifestyle. Our WELLNESS PROGRAM is a comprehensive assessment consisting of tests and measures from evidence based research that is approved by the American Physical Therapy Association (APTA) that will establish your present level of health. At the conclusion of the assessment you will be given recommendations to modify your lifestyle choices and advise on how to proceed. You can choose a variety of ways to improve your health and you can choose as much guidance as you need to be successful with your goals. to our patients at the Marblehead Y.